Velvety soft cake and gluten free seem contradictory – good thing we’ve cracked the code to the BEST gluten free and vegan red velvet cake. Layers deep red chocolate, vanilla, espresso and buttermilk flavoured cake, dark chocolate ganache, and our classic cream cheese frosting. Let’s get baking! The BEST Gluten Free and Vegan Red Velvet Cake - EVER! Yes, we absolutely mean that. This red velvet cake puts all gluten free and vegan (and even butter and wheat laden) cakes to SHAME! Why, you ask? Because of the chemistry of our Cloud Nine Vanilla cake mix, in combination with the epically delicious and complex flavours of a red velvet cake. Now, red velvet cake is really just an overrated cake with an identity crisis- its not really chocolate, its not really vanilla, its bright red just because. We are not huge fans of the cake, mainly because most people do it WRONG. It can be an incredible and unique cake-xperience if baked properly. It requires time, effort, expensive ingredients, love, and patience. But when done right, this cake can be queen. Gluten free and soft velvety cake really don't go together, do they? But in this cake, that grainy cardboard taste of gluten free is no where to be found. It really is no where in any of our treats. We filled each layer of cake with our signature cream cheese frosting (blog post on how to make the best cream cheese frosting coming VERY soon), dark chocolate ganache, and macadamia nuts. The nuts are totally optional (we see you nut - free friends), but they do add a lovely crunch and depth of richness... because this cake just isn't rich enough on its own!! (Kidding, this cake is a alot). 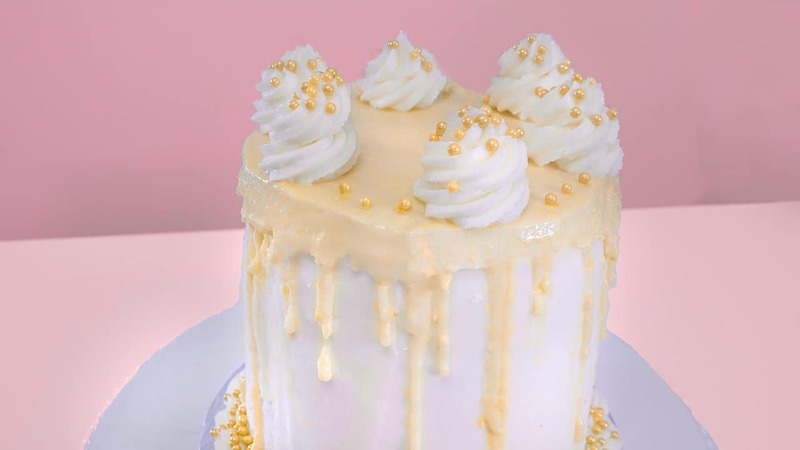 We then top the whole thing off with more cream cheese frosting, a white chocolate drip, and gold pearls. This is a fancy cake, so it deserve to wear gold jewels. You can decorate it however you please. The recipe below will take you through the steps to getting the cake to a beautiful white finish. The video is incredibly helpful for the construction of the cake. Icing tools are ESSENTIAL for this cake: at minimum a cake board, revolving cake stand, a piping bag and offset spatula. A cake scraper is also fantastically helpful to make the perfect flat edge, but you can get away without it. You can find all these wares on our Kitchen Essentials shop page! It's definitely worth browsing- all of our tools that we rely on are featured in there. Having the right tools really helps elevate your baking and decorating game... so if you're truly a DIY King/Queen, you need to outfit your home bakery properly. 4 cups Icing Sugar, sifted. Preheat oven to 350*F. Grease and parchment line the bottoms of 2-3 6" cake tins. Set aside. In a small side bowl, mix apple cider vinegar and gel food colouring with non-dairy milk. Whisk well and set aside. To a large mixing bowl, combine and whisk oil, coffee and cocoa powder. Once mixed well with no clumps present, add in the non-dairy milk. Whisk well until fully combined. Pour in baking mix. Stir with spatula or whisk until combined with no lumps present. Pour 1 to 1.5 cup of batter into a greased and parchment lined 6" cake tin (just the bottom needs to be parchment lined so the cake doesn't stick). Spread to cover entire bottom of pan. Bake cake for 15 minutes until the top has risen and is firm to the touch (ie. it doesnt feel like there wet unbaked dough underneath). The top of the cake will look brown. Do not worry- it is red on the inside! Repeat baking until all the batter is used. Remove cakes from baking tin once cooled by running a butter knife around the edges of the cake. Place a cutting board on top of the tin, and while holding the board and the tin, flip it over. The cake should pop right out. Let cakes cool completely on a cooling rack. If desired, carefully cut off the edges of the cake using a sharp knife. Ridding of these "caramelized" parts makes for a more consistently textured cake (no hard edges!). Once cooled, wrap in plastic wrap and store in the freezer for 4-6 hours (the longer, the better). While your cakes are baking and/or cooling, in a stand mixer (or hand electric mixer), beat together the cream cheese, butter and shortening for 2 minutes until completely combined and creamed. The buttery mixture will be a bright white and very soft and fluffy. On a low speed, add a quarter to half cup of icing sugar into the buttery mixture, and mix until just combined. Continue this until all icing sugar has been combined. Add in vanilla extract at this time, if desired. Whip entire mixture on high speed for 2-3 minutes. This is essential to ensure your icing is light, fluffy and well combined. Let frosting refridgerate in the mixing bowl until you are ready to use it. In a microwave safe bowl, heat non dairy milk for 30 seconds. Add non dairy butter and chocolate to the heated milk and stir. The butter and chocolate will begin to melt. Melt the butter and chocolate mixture in the microwave for 1.5 minutes in 30 second intervals. Stir between intervals using a spatula or spoon. Once all the chocolate has melted, combine 1/4 cup of icing sugar with chocolate-butter-milk mixture. Stir between additions until no clumps or dry pockets present. Your ganache should be runny and thick, similar to the texture of melted chocolate on its own. Once prepared, set aside in the fridge or on the counter. This can be reheated in the microwave when its time to make the cake. Microwave and stir in 30 second intervals. Watching the video will really help with this process. 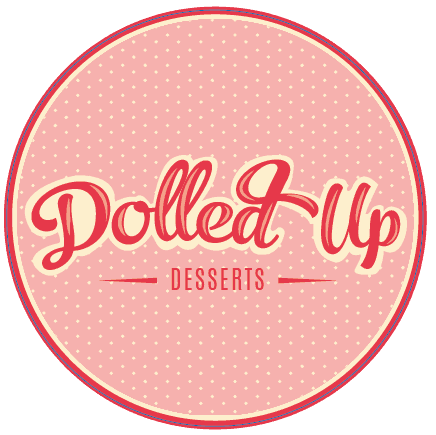 You will need a revolving cake stand, 6 inch cake board, an offset spatula and 2 piping bags. A cake scraper is also ideal but you can get away without one. Find all of these tools on the Kitchen Essentials page of our shop! Start by filling a piping bag with frosting and cutting a 1cm diameter hole off the tip of the piping bag (if your hole is too small, itll take FOREVER to frost, but if too big, then it'll be an uncontrollable mess). Pipe a tablespoon sized amount of frosting on your cake board/plate, and spread it using an offset spatula. This will help hold your cake in place as you spin it around on the board. Unwrap your first layer of frozen cake. Place it top down on the cake board (the bottom of the cake will be facing you). Take your piping bag and pipe an even tube of frosting around the circumfrence of the cake. It will make a wall for the chocolate ganache to stay inside the cake and not drip out the sides. Spoon about 3-4 tbsp of chocolate ganache onto the layer of the cake. Spread using the back of the spoon so it is even and covers the top of the cake. Make sure it stays within the limits of the icing wall! Pipe another tablespoon sized amount of frosting on top of the ganache and spread with the offset spatula. This is to secure the second layer of cake to the first. Place the second layer of cake with the top down. Repeat these steps until all your layers are stacked. Do not put ganache on the top layer! It's time to make the crumb coat. This is to keep the crumbs in the cake, so this does not need to be perfect! Be quick and get the crumb coat finished since your cake is defrosting by the second. Take your piping bag and pipe an even "spiral" of frosting around the top of your cake. Making use of the revolving cake stand will help in this. Once the top is covered, you can ice the sides of the cake however you want (vertically, horizontally, diagonally). You do not require a lot of frosting for this (ie. don't cover the cake). Once each side of the cake has at least a line of frosting on it, get your offset spatula (or cake scraper) and smooth the frosting. We need to cover the entire cake with a thin layer of frosting so get covering! Keep the top as flat and smooth as possible in this process, but you can also scrape "extra frosting" from the top and bring it down the sides. Keep things straight and even to the best of your abilities. Once all sides of the cake are encased in icing (it'll look messy, thats perfect! ), take your cake to your freezer and freeze it for at least an hour. The longer you wait, the more time you will buy yourself when you need to finish the final coat of icing. Once the cake has chilled, we are going to repeat the icing process. Pipe a single layer spiral on the top of the cake, but this time, continue that spiral down the sides of the cake. The entire cake should be covered with a thick "Michelen Man" like layer of frosting. Take your offset spatula or cake scraper and smooth the frosting. You want to keep your spatula at a 90 degree angle to the cake to ensure the cake is straight and even. A revolving cake stand helps A LOT for this, as you can keep your hand still and just roate the cake around. Do not spend a ton of time on this- it can become an obsessing thing to try and get the sides "perfect". Do your best, and just keep making more cakes so you can practice this. 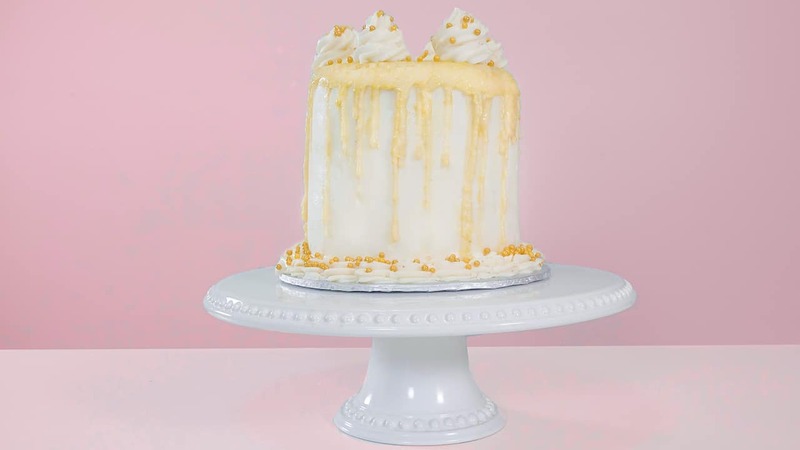 To smooth the top of the cake and any icing that may have "crept" over from the sides, just take your offset spatula and smooth it into the top. Again, do not obsess over this. You have a defrosting and unstable gluten free cake on your hands. Once the icing is as smooth as you can get it, freeze it again for at least an hour. In this time, you can prepare any of the "toppings" or decorations you want for this cake. 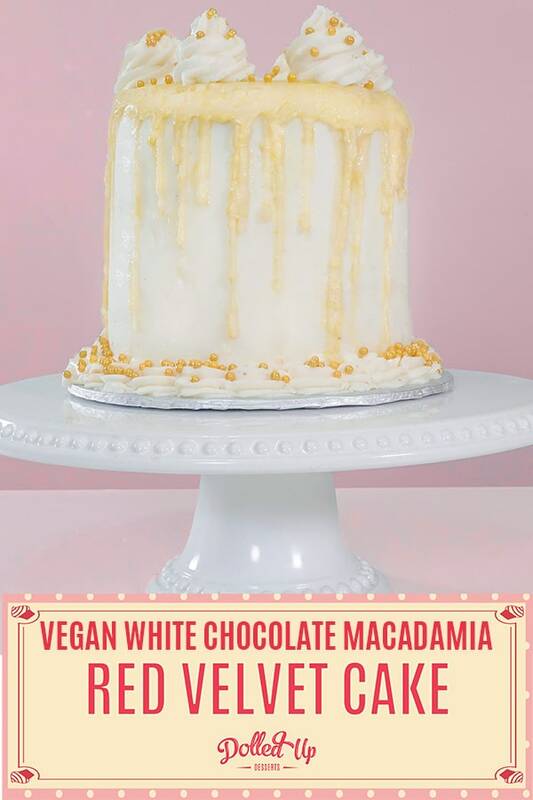 Some options include: - piping 6-8 rosettes on the top of the cake using a star tip and a new piping bag; - dousing it with your favourite coloured or metallic sprinkles; - making a chocolate ganache drip or white chocolate drizzle on the sides of the cake; - keeping it simple and white. When ready to serve, remove cake from freezer an hour before serving and keep it on the counter. Cut with a wet and sharp knife. Serve and enjoy fully! Store your cake by covering it in saran wrap or tin foil in your fridge or freezer. It is ideal to keep it in the freezer as it will retain more moisture in the cake. However the fridge should be okay for a maximum of 48 hours post cutting.